JAY-Z sure does know how to commit to a bit. At 4:44 p.m. ET this afternoon—you know, like the title of his latest album?—the hip-hop multi-hyphenate released a lavish, star-studded video, “Family Feud,” directed by Ava DuVernay. Opening with a sepia-tinted, Godfather-esque scene of violent family drama, the video injects a baroque visual sensibility inspired by Catholic iconography into a sci-fi saga spanning more than 400 years, tracing the illustrious lineage of the Carter dynasty through scandal, intrigue, war, and a multiracial council of “founding mothers” headed by an adult Blue Ivy Carter, played by Susan Kelechi Watson. 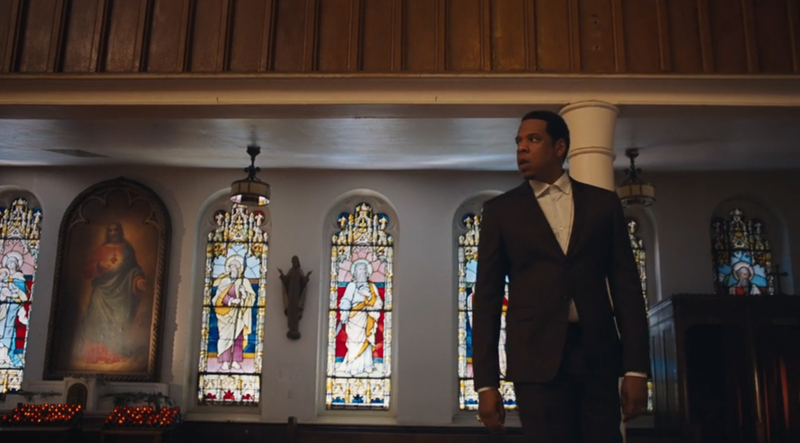 Five and a half minutes in, we land back in the present day for the music-video portion of the evening, as Jay confesses his sins in verse to Beyoncé, who stands at the pulpit of a Catholic church clad in a regal navy-blue outfit that’s part Egyptian queen and part medieval abbess. Omari Hardwick, Jessica Chastain, Michael B. Jordan, Thandie Newton, Trevante Rhodes, Emayatzy Corinealdi, David Oyelowo, America Ferrera, Storm Reid, Brie Larson, Rosario Dawson, Rashida Jones, Mindy Kaling, Constance Wu, Niecy Nash, Susan Kelechi Watson, Janet Mock, Henry Sanders, Irene Bedard, and of course, Beyoncé Knowles and Blue Ivy Carter all co-star. (We told you it was star-studded.) A 45-second preview of the video is available on the Tidal website, but you’ll have to sign up for Tidal to watch the whole thing (for now, anyway).